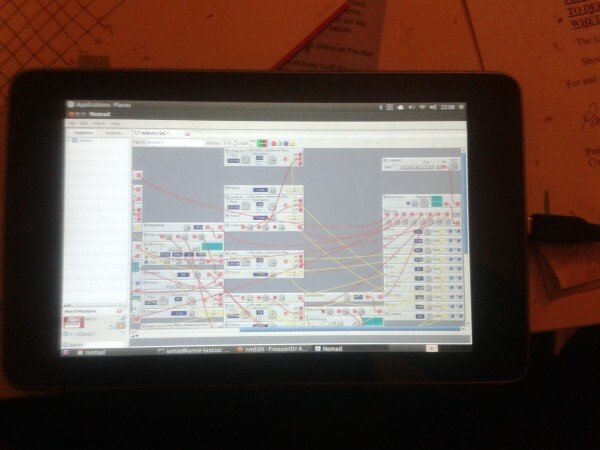 electro-music.com :: View topic - Nomad working on nexus 7 ubuntu 13.04 !! Nomad working on nexus 7 ubuntu 13.04 !! Posted: Tue Jan 07, 2014 3:48 pm Post subject: Nomad working on nexus 7 ubuntu 13.04 !! Just got nomad working sort of with a google nexus 7 running ubuntu linux desktop 13.04 for arm processors in gnome 3.8 mode , hooked up to a maudio axiom 25 formidi, no drivers. I had to launch it from the terminal and im having some problems saving files both to the synth and to the internal storage, but it edits fine, making a very portable touchscreen editor... a stylus or mouse is definitely required though, everything is pretty small. The error i get when trying to save to internal storage is "could not find service to save file" ?? Dunno much about linux yet so maybe just something small i need to change. and now saving files to internal storage, I had to select the filetype for saving and loading... fully working tablet editor! I managed to get Nomad and the editor running under Wine, but how did you get the patches loading, and saving to and from the Nord? I've had no luck. I'm using Ubuntu 12.04 and have a midi to USB connector. As of just now, I can get the NordEditor running with Wine, imorting and saving patches to and from the synth, but not Nomad. I used aconnectgui, but it's not working with Nomad. I would prefer to experiment with Nomad. Did you get nomad to start? Then connected to the nord using the connection dialog in nomad, the midi ports of my maudio controller were listed there automatically. After pressing connect again the current patch in the nord loaded up. For loading and saving to linux I had to make sure the file type was selected in the save dialog. Are you using a nexus 7? I had to switch to the Gnome environment, for some reason it wouldnt run in the standard ubuntu desktop. Ive now also got this running on a raspberry pi with slightly less hassle in the setup, and over vnc wifi on an ipad... its quite good! I can get Nomad running, saving and making patches okay, but not communicating with the synth, neither to save or to load. Where did you get to a 'connnect dialog'. I can't brows the banks, or change any settings under the 'Nord Properties'. I'm running Ubuntu on a PC I built. I've been able to run the NordEditor under Wine with success, but not Nomad. Have you tried File/New/synth ? Then the spanner settings icon that appears in the bottom left section to set up midi. The yellow diamond icon next to that should connect you to the synth once your midi interface is selected. Indeed I have. I get an error that communication has timed out. have you tried another midi cable? turned out to be my culprit all this time.